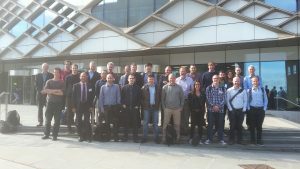 The Engineering Nonlinearity (ENL) 5th Annual Review and Final Showcase Meeting took place at the Diamond Building, University of Sheffield from 3-5 July 2017. The University played host to over 40 attendees over the three days from the project’s academic and industrial partners, and the Steering Committee including Josie Robinson of the EPSRC. Proceedings were opened by Principal Investigator, Prof. David Wagg, who formally welcomed everyone to the meeting, and gave an overview of the ENL project. His summary of the Outcomes and the Legacy of ENL are noted below. Prof. Wagg then introduced the Keynote lecture, “Using the Dynamic Stiffness Method to Interpret Experimental Data from a Nonlinear System”, given by Prof. Mike Brennan of UNESP, the Universidade Estadual Paulista Júlio de Mesquita Filho (São Paulo State University). Prof. Brennan outlined in a fascinating talk how this traditional method could be adjusted to provide insight into the nonlinear behaviour of systems. The agenda then worked through the five project themes, with presentations for each theme including an Early Career Keynote, a Theme Overview, and a Research Presentation. The Early Career Keynote for Theme 1 – System Identification was given by Dr Nikos Dervilis, Lecturer at the University of Sheffield, and formerly a researcher on ENL. Nikos outlined some of the exciting work with Siemens he is involved with, working on condition monitoring of offshore wind turbines, which uses some of the techniques developed during ENL. Prof Keith Worden then gave the theme overview, followed by the Research Presentation from Dr Anis Abdessalem, a researcher on the ENL project. Next came a networking lunch and poster session, showcasing some of the key work from the ENL project, including some of the project’s nonlinear demonstrators. Charlie Field, Business Development Manager for the Structural Dynamics Laboratory for Verification and Validation was also on hand to talk to those interested in this major facility supported by the EPSRC and managed by the University of Sheffield. Lunch was followed by the Theme 2 – Random Vibrations presentations, starting with an Early Career Keynote from Alessandro Cabboi, currently a Researcher at the University of Sheffield, and previously a researcher on ENL at the University of Cambridge. This was followed by the theme overview from Prof. Robin Langley, and a Research Presentation from Dr Fiorenzo Fazzolari. Following a coffee break, Theme 3 – Nonlinear Modal Analysis and Testing brought the formal proceedings to a close for day 1, starting with an Early Career Keynote “Nonlinear Modal Testing using Control-based Continuation” from Dr Ludovic Renson of the University of Bristol, formerly a researcher on ENL. The theme 3 overview was then given by Prof. Simon Neild and Dr Tom Hill. A research presentation “Nonlinear model updating strategy for structures with local nonlinearities” followed from Dr Xing Wang, a researcher on the ENL project. Following a group photo, the delegates later convened for the Conference Dinner at the Mercure Hotel, Sheffield. Day two opened with Theme 5 – Active Control, with an overview entitled “Nonlinear Velocity Feedback and Dynamic Range Control” presented by Prof. Steve Elliott, and a research presentation from Dr Maryam Ghandchi Tehrani of the University of Southampton. Dr Alex Shaw, a Lecturer at the University of Swansea and former ENL researcher, then gave an early career keynote related to Theme 4 – Bifurcation Analysis, with Prof. Mike Friswell giving the theme overview, and Dr Rafael Sanchez Crespo, an ENL researcher giving a presentation “Modelling and Experimental Testing of Rotor-Stator Contact in a Coupled Double Rotor System”. The last presentation before lunch was given by Dr Ifigeneia Antoniadou, a Lecturer at the University of Sheffield and former ENL researcher, outlining some of the work she performed on ENL regarding ontologies, and developments since. Following the networking lunch and poster session, an Industry Collaboration Lecture was given by Dr Mark Bateman of EDF Energy, and Dr Malcolm Scott of the University of Sheffield and an ENL Researcher – “Control Rod Performance Modelling”. Dr Julian Londono, a Lecturer at the University of Exeter and a former ENL Researcher, then gave an early career keynote outlining some of the work developed during his career, including that related to his time on ENL Theme 3. A coffee break then preceded the remaining two talks – a research presentation from Dr Thibaut Putelat of the University of Bristol, who presented some of his recent work involving the modelling of rat’s whiskers, followed by an early career keynote prepared by Dr Irfan Khan of the University of Sheffield, and presented by Prof. David Wagg on his behalf. This brought to a close to proceedings for most attendees, with the Management and Steering Committees only continuing with a thank you dinner for the Steering Committee (SC) at Browns Restaurant in Sheffield, where they were very pleased to be joined by former SC chair Prof. David Ewins. The SC continued into day three with a breakfast meeting at the Leopold Hotel, and as this was the last meeting they were joined half way through by ENL Lead Prof. David Wagg, to discuss the success and practical steps to implement the proposed legacy of the project. The SC and MC members then caught the train to Hathersage for a most enjoyable walk in the Peak District, followed by a lunch at the George Hotel including feedback discussion and recommendations for ENL legacy, which Project Manager Dr Geraint Jones and Prof. Wagg will look to implement.